Jeremy Schumacher and his friend, Amalia Pappanastos, from Steamboat Springs, Colorado vacationing here in Fort Lauderdale chartered the Top Shot Sportfishing charter boat team for a private deep sea charter boat sport fishing trip in Fort Lauderdale, FL. Captain JB was at the helm. 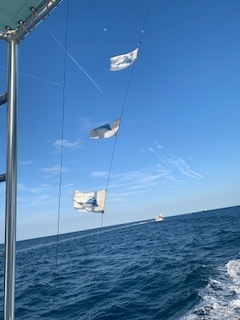 We decided to do some Sailfishing so I went out south of Fort Lauderdale to one of our wrecks that are in shallower waters. For the last couple of days, Sailfish have been showing up anywhere between 80 ft. of water out to 135 ft. due to our south current. I put out two kites with 2 live Goggle Eyes from each kite. It did not take long before the action started. Black shadow – right long – dorsal and bill out of the water chasing the live bait around. Hooked up as the Sailfish came out of the water immediately and threw the hook. We reset waiting for his arrival. Double header Sailfish! One on the right kite and the other on the left kite! Both anglers hooked up! After a short time, Amalia’s Sailfish threw the hook. Jeremy did a great job bringing the Sailfish to the side of the boat, and pictures were taken. We reset, and again waited for his arrival. Hooked up once again and Amalia successfully brought the Sailfish in, as well as Jeremy – Great jobs you two on catching three out of 6 Sailfish. With smiles on the anglers’ face, it was now time to head back to the dock. The happy anglers retired into the a/c salon watching the plasma TV and enjoying the relaxing trip back to the dock at Bahia Bar Yachting Center, 801 Seabreeze Blvd. Fort Lauderdale 33316.